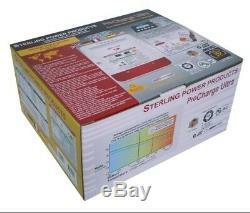 Sterling Power Pro Charge Ultra PCU1260 12V 60A 3 Way Marine/Lesiure Battery Charger. Sterling Pro Charge Ultra 12v 60A (3 out) 3 output PFC global charger 110 and 230 v 50-60 hz 12 v 60 amp model, all other units pro rata Input voltage range 90-270 v 40-70 hz Power Factor at 230 v 0.976 Efficiency 89.4% Full load current (110/230v) 9.8/4.6 Ripple noise R.
14mv Ground leakage 0.5 ma Generator/ mains power required to run unit (watts) 12 v 60 amp approx 900 watts volt metre accuracy +/- 1% amp metre accuracy +/- 1% Every so often it becomes necessary in a competitive market to simply raise the bar so high its leaves everyone in your wake, we do this regularly on other products but this year we re-visited our standard battery charger range to make a product so far beyond our competitors for performance, style and value that you simply leave them behind, with this new charger we like to think we have done just that. With our years of experience in this market we thought of everything we could possibly think of and combine it all into this product range, resulting in the battery charger. Extra new features on this product above and beyond of standard features include: 11 pre-programmed battery curves including: Open/Sealed lead acid, AGM, Gel, LiFePO4. 1 custom set, can be set from charger, unlike our competitors there is no need for a computer to do this operation, all can be done from the front panel. 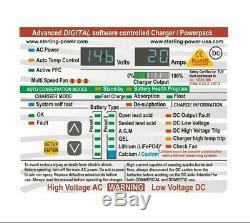 2 x digital meters for current and voltage measurement and a 32 LED information display. At high ambient temperatures (40-50 deg C), however, fans would still be required to ensure operation. Primary (processor digitally controlled) and an emergency backup secondary (analogue controlled) high voltage trip. 32 LED information panel to ensure maximum information transmitted to owner. Internal scan and systems check to ensure product is okay. Small footprint and light weight. Include battery temperature sensor to give temperature compensation and high temp trip. As with all our marine chargers all metals used are non-ferrous or heavily protected, so no corrosion. New synchronised rectification output as opposed to diode output, giving up to an extra 9% efficiency. Conforms to ABYC drip test, is waterproof from water directly dropped on to the top of the unit (+/ - 17 deg) if installed correctly (vertically). Thermostatically controlled force draft cooling. The printed circuit boards are conformal coated for high humidity and salt air operations. The item "Sterling Power Pro Charge Ultra PCU1260 12V 60A 3 Way Marine Battery Charger" is in sale since Sunday, February 3, 2019. 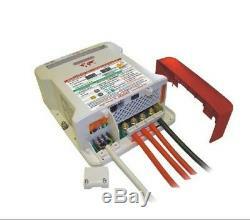 This item is in the category "Vehicle Parts & Accessories\Boats Parts & Accessories\Accessories". The seller is "logan_don_vito" and is located in London.